Yes; your PortQry output indicates that your computer can open TCP connections to the servers. I have one last question: can you download any files from the update server? Edit: I've devised a procedure that will allow you to update your client without using the updater! its working !!! hahaha! followed everything edit 1 and edit 2. thank you so much! If you've configured Windows to use my proxy, then both the Renewal and Classic updaters should be able to retrieve updates, and you therefore won't need to bypass them. The differential update procedure, which I no longer recommend using, will not update the Classic client. This has been my problem for a week already and even resulted to reformatting my laptop to delete any files that might be corrupting ragnarok. However, none of those seemed to have worked hope you could help. Thank you so much! Have you tried using my proxy? This has resolved the same problem for several other people. Edited by katehuang, 23 May 2017 - 04:04 AM. Hmm… that is very strange! 1. Which version of Windows are you using? 2. Do you have the latest version of Internet Explorer (11) installed? 3. What security software, if any, is installed on your computer? Install Internet Explorer 11 (which may be included with Windows 8.1). Install all available Windows updates. Temporarily uninstall all third-party (non-Microsoft) security software from your computer. Edited by Axylus, 24 May 2017 - 12:16 AM. Edited by katehuang, 24 May 2017 - 09:04 PM. what do you mean by client installation folder? 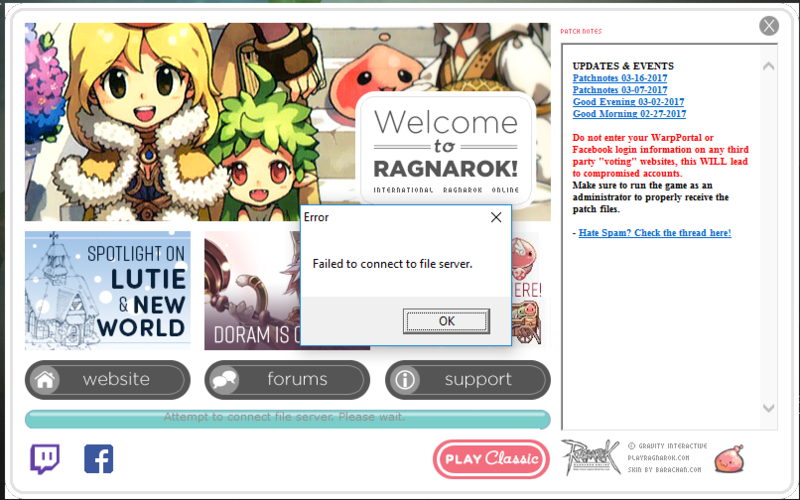 the installed Ragnarok folder or the installer? 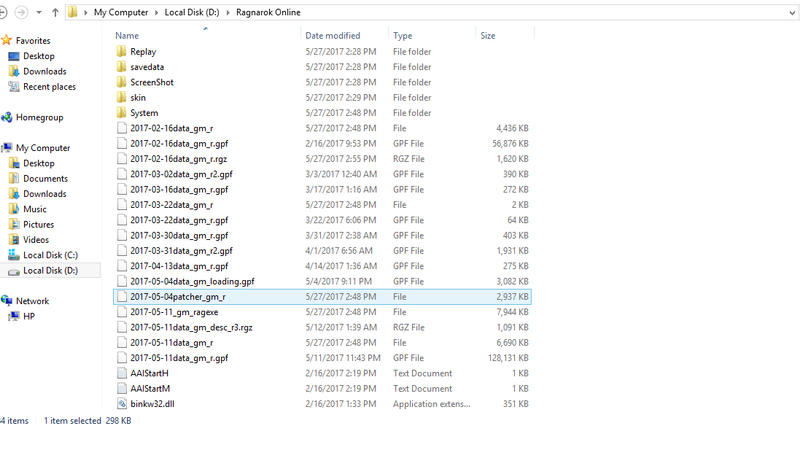 I extracted the files but it still keeps on patching everytime i open the ragnarok patcher. 1. Did you clear Internet Explorer's cache? If not, then do so. Close any and all open clients. Move both of the files into the client installation folder, and choose to replace the existing versions. Edited by Axylus, 26 May 2017 - 07:45 AM. thanks. I got it fixed by replacing the patch txts. Great another problem popped up! I kept on reinstalling my client and even but I still keep on getting the sprite missing and it crashes my client. It's so annoying. I downloaded the latest update and extracted them on my Ragnarok Installation folder but still it keeps on crashing with the missing sprite and all. HEEELP. This is where I extracted the 2017 update please check if I did it right. After that it shows me weclomescreen, then I press OK and it crushes! still not connecting to the file server. For the record, TroyZeroAlpha resolved this problem by updating his client after his internet bandwidth allowance had been renewed. 1. Have you tried resetting Internet Explorer's configuration? Note: You must use Internet Explorer because the updater uses it to fetch updates. 3. Can you download the file using Chrome or Firefox? Actually i have 2 error messages in my game. Evertytime i open the achievements tab, the game crashes. I can play normally if i dont open that tab, but i want to know how solve this problem. Warning: Don't follow these instructions if you last updated your client before 2017/2/16 because doing so will cause your client to skip installing one or more updates. Follow steps 4 to 5 in item 4 of the guide. Move the file that you downloaded in the previous step into the client installation folder, and replace the existing version of the file. Edited by Axylus, 16 June 2017 - 03:56 AM.